If you spot a connection between Marathon and Halo, Halo: The Fall of Reach, Halo: The Flood, Halo: First Strike, or anything else Halo-related, let us know. It'll go in here, and you'll be cooler than the homeworld of the Grunts. The Marathon Addendum : Our very own list of Marathon references in Halo, both blatant and sly. It shouldn't have escaped anyone's attention that both the word Marathon and the SPARTAN II commandos are references to ancient Greek history. Marathon takes its title from the battle of the plains of Marathon, between the armies of Greece under Multiades and an invading Persian force under king Darius I in 490 BC. The Greeks were victorious despite overwhelming odds, and sent the Greek soldier Phidippides to run the 26.2 miles to Athens to announce the victory, which he reportedly did before dying of exhaustion. Comparisons could be drawn between the Persian empire and the Covenant, although they would be tenuous at best. The Persian armies employed troops from nations throughout the empire, not unlike the many races that form the Covenant. The Greeks had been facing Persian attacks on their ports and cities for years, and had been largly defeated, not unlike the human empire which is being inexorably devastated by the Covenant navy . The Persians were religious, but with one of the most peaceful religions of the time (Zorastranism: its notable tenets included the forbidding of animal sacrifices and a strict injunction against attempting to convert others), so finding a parallel there would be difficult. Given that Jason Jones has a well-known love of accounts of historical battles, the references shouldn't be surprising. I'm curious whether or not the name SPARTAN II was picked in order to draw attention to some aspect of Halo's story. Anyway, I hope most of my history was relatively accurate. Both historical and Marathon connections are peppered liberally throughout Halo, and I think it fitting that just as Halo is somewhat of a "next generation" of Marathon (in gameplay, anyway-the actual link between the two stories is clouded, but grows clearer every day), the Battle of Thermopylae, discussed heavily in The Fall of Reach and hinted at in Halo, was the "next generation" of the Battle of Marathon. On an entirely different note, all apologies for the lack of updates yesterday; we're experiencing some pretty big technical difficulties; we can still update the site, just in a much longer, disjointed way (sort of like going from San Francisco to New York by way of Anchorage). Don't worry though-everything should be worked out soon. Until then...postulate away. During the first level of Halo sometimes a marine will say "Look a Mark-Five". An apparent reference to your MJOLNIR armor. "There is surprisingly good news planetside: nine military Mjolnir Mark IV cyborgs were covertly living among the colonists, and acting together they were able to single-handedly turn back the latter stages of the Pfhor assault. Casualties on the colony were nowhere near as high as those we experienced here on the Marathon." The first thing that I noticed, that really brought me back to the good old days, is hearing the Covenant grunts screaming "THEY'RE EVERYWHERE!" just like the Bob's did in Marathon. Short but sweet. While we normally don't post submissions of combat dialogue (though plot-specific dialogue is certainly welcomed, and continue to send in any combat dialogue you find noteworthy, as at some point in the future we'll be compiling a list of everything the Marines and the Grunts say), this Marathon connection is just too good to pass up. They even SOUND like the old Marathon Bobs. And on the note of Bobs...our very own Astro the Space Duck has a challenge...it is physically possible, though very difficult, to FRoG Blast the Vent Core in Halo. Make of that what you will-and if you think you know what we're talking about, let us know, and don't hesitate to give it a try. We'll give you a prize if you can pull it off and take pictures. A BIG prize. Even if we assume that the "Military Calendar" does not differ that much from the one used in Marathon, there are ways we can rectify the two timelines (as long as we allow for some other assumptions :). The Marathon story states the the Marathon ship-moon took ~300 years to reach Tau Ceti; it left Mars in 2472 and arrived in 2772. During that time, they were presumably cut off from direct contact with Sol-space, and thus could not benefit from advances made during their travel (such as Slipspace engines). In this case, they would have remained at basically the same tech-level as when they left (which helps explain why in the game you are able to use ammo left over from a coup 300 years earlier :). We do know that the 10 Mark IVs were in stasis during the entire voyage. Of course, it's also possible that the Mjolnir project of Halo is supposed to be a continuation of the Marathon one, and therefore the "Mark V" designation is correct (but still only refers to your armor). Since the use of "battleroids" was outlawed in 2194, they could have restarted the project with live humans in mind. 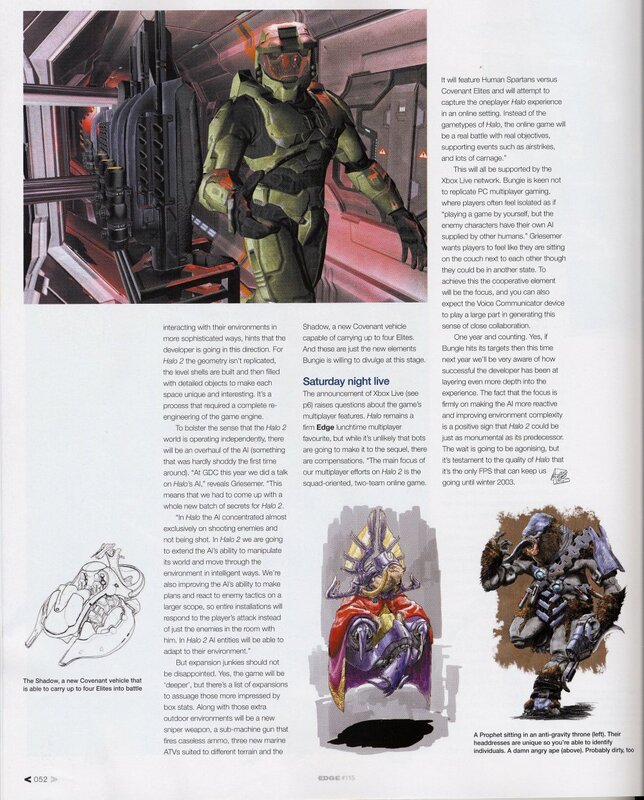 In my own opinion, the "Mark V" is simply a reference to the fact that the Master Chief is wearing a Mjolnir Mark V suit (as detailed in the Fall of Reach and the Halo Manual). As for the part about the Marathon being out-of-contact for over three hundred years, one wonders why the Marathon received no radio transmissions of any sort from the human worlds; Tau Ceti is less than twenty light years from Earth, so it would not take long at all for a signal from Earth to reach the Marathon mid-flight and inform them of whatever advances have been made in human civilization. More likely in my mind is that Halo takes place thousands of years later. My primary evidence for this is the reference to the "lost colony worlds" which were recontacted at some point by the UNSC. Unfortunately, I've completely forgot the source of this information, but I'm certain it's out there. Anyone care to give it a go? Marathon connections - They're Everywhere! "The Pillar of Autumn is forty-three years old," Cortana said. "Halcyon-class ships were the smallest vessel ever to receive the cruiser designation. It is approximately one-third the tonnage of the Marathon-class cruiser currently in service." Also, it has been noted that Captain Keyes has a Marathon logo on his uniform. But how closely have we observed the Pillar of Autumn? Toward the back, just before the engines... Check out the opening cinematic, and the one that starts The Maw. Look familiar? takes my breath and hurls me to the ground she lea%! There has been a lot of debate in years gone by as to whether the author was Durandal, you the cyborg, or someone else entirely. I do not intend (nor could I) solve the mystery now, but I will submit the idea that our friend John-117/Master Chief and the Security Officer from Marathon are one and the same individual. I am still holding on, waiting for the two timelines to be perfectly aligned without the need of any time travel or dimension jumping; hoping that the Halo story will fall into the "Century Left Intentionally Blank" in the Marathon timeline, and any apparent contradictions will be explained. Second, as has been explored previously, I firmly believe that Cortana will or, more than likely, has already become rather selfish (to put it mildly) and has some shady motives of her own. She is not to be trusted. Now, if "I" is our eternal hero, Master Chief, and Cortana the "she" spoken of we have a peek into the development of their relationship over time. Pointed out to me by me comrade Richard, the most amazing and relevant phrase is "she splinters an ancient oak with a force that takes my breath", the very definition of the name "Pillar of Autumn". I find this amazing. As the subject of my email states, this could be a gigantic coincidence, but knowing Bungie and also considering that the name Pillar of Autumn had been decided on very early in Halo's development this may be an important link. Of course the entire text could be interpreted very differently: perhaps the "she" is speaking of the Covenant? The phrases " she devoured the lawn and trees with a translucent blue flame" and "screaming my sins" suddenly become extremely meaningful starting from that presupposition. I hope you and others also see what could be, an immense portent. Interesting indeed. Could Bungie possibly be so far-minded, planning behind the thin slice of the Marathon universe covered in the games, building entire characters and personalities and histories which are revealed to us only now? Perhaps. Clearly, the connections are everywhere-and this one is one of the stronger, though more odd, ones. "devoured the lawn and trees with a translucent blue flame and tore flagstones from the path and hurled them into the sky screaming my sins"
The destruction of Halo? Sounds a lot like it to me. And of course, the splintering of the ancient oak-the destruction of the Pillar of Autumn, which leads to the fall of Halo. It was Cortana's idea to detonate the Autumn's fusion cores, thus setting about in the dismantling of Installation 004. This is just another element of correlation between the Master Chief and the 10th Mjolnir Cyborg; the cyborg seems to have known of the Master Chief's exploits. Are they his own exploits? Perhaps we shall know soon enough. I just happened to notice a small quote from Fall of Reach: "He displays an odd sort of attitude for a creation of the military: he does not glorify his actions, he merely does what he has to do. He does not hate his enemy; he kills them because he knows it is his duty to kill them. "It wasn't [the Chief's] job to make things suffer - he was just here to win battles. Whatever it took." This is hardly breaking news i know, but thats state of mind is very similar to that of the cyborg in Marathon. He never objects to the orders either of the AI's give , even though he know they work against each other some times. That always seemed a bit odd to me, the side swapping. I was wondering, could this be something the cyborgs have been programed to do? Maybe an implant that suppress any moral objections if the order is given from an authorized source(such as Marathon AI's). It would hardly be surprising if this is the case. You wouldn't want your battleroid having second thoughts. The real reason i'm sending this is because in that quote it sounds as if it was in the Chief's nature to follow orders no matter the consequences. I don't think that's the case. I think he's been programmed to do so. Or more correctly, i think the cyborg in marathon has and i also think they are of the same kind. I think it's important to note that while the Chief always follows orders, he isn't always happy about it; after his Spartans nuke Cote D'Az?r to the bedrock, he spends much time devoted to the moral quandries caused by such an event. Also, after the fall of Reach, the Master Chief goes into a sort of regession, having lost all of his Spartans. The Master Chief tries to win, in the most glorious, pyrric sort of way, but he certainly harbors moral discontentment afterwards. That said, note that the Master Chief never seems to feel sorry for his enemies. He kills the Covenant and thinks not much of it, just as the Marathon cyborg waded through the ranks of Pfhor garrisons, never batting an eyelash at the fact that he was a mass murderer. Or, perhaps he did. The Electric Sheep levels, anyone? If that's not the closest thing to the cyborg's nightmares, I don't know what is. More on the Marathon terminal connections discussed yesterday. "we met once in the garden, at the beginning of the world and unaware of our twin destinies (not the garden of Genesis, but another; forgotten, untended and now choked with weeds, unvisited except for ourselves)." Sounds a bit like [a] Halo, ne? Indeed it does. Methinks it's time for a full-scale assault on the Marathon's Story Page; an assault with fine-tooth combs. It's time to sift. More on the Kill Your Television terminal. 1. My guess is that Durandal was the author of the text. The author speaks of being called hundreds of names, and being called a thousand more before the world goes dim. That sounds like something Durandal would claim to me. 2. So, if the text was by Durandal, who was he talking about? Here, I would definitely agree with Daniel, that he is talking to Cortana. It just makes so much sense. One thing I noticed is that the "she" in the text is referred to as "a sword drenched in my blood," and we know Cortana is the name of a sword. Going on these assumptions, it would seem that Cortana has been around for a long time, at least as long as Durandal. Maybe the garden referred too is the computer where they were both designed. Just a thought. But this leads to the question, why didn't we hear of Cortana at all during the Marathon series? Well, here is my hypothesis. Marathon was the story of Durandal. Halo is the story of Cortana. Whether this is valid or not, and how it actually works, I do not know. You decide. This terminal is turning out to be quite the confounded beast, with connections coming out of it like pipes out of a...um...pipe factory. If Marathon is the story of Durandal, and Halo is the story of Cortana...what is the story of Ogier the Swordsmith? I read a letter on your page that said a person explored Halo's control room via banshee on the level, "Two Betrayals." I decided two try this out myself, and found a startling revelation. I took the banshee into the control room and flew to the center section, then flew up to the top of the room. Finding nothing, I turned back to go down, and while facing downward, I noticed that halo's control center's walkway is shaped in the form of the Marathon logo! Long before Halo, Bungie had released a trilogy of games, the Marathon series. The games have a cult following, and are part of the reason Bungie.Org exists today. With the release of Halo, many Bungie fans noticed the connections between the Halo and Marathon Universes. Most obvious is the liberal use of the Marathon logo in Halo. It's seen on the Pillar of Autumn, Captain Keyes' uniform, and even in the Halo logo on the cover of the box the game came in. Many people have suggested that the logo can be found in other places within Halo, as well, though often it turns out to be a stretch of the idea. Another well known connection between Halo and Marathon is Master Chief himself. Master Chief is a MJOLNIR MkV cyborg. MkVI in Halo, with his new battle armor. The character you play as in the Marathon trilogy is believed to be an MJOLNIR MkIV. Those are two very well known Marathon connections. However, Cortana is also a Marathon connection, though it isn't as well known by people as the two aformentioned examples. In the Marathon trilogy, you fight encounter after encounter at the whim of a rampant AI known as Durandal. Durandal was the name of Roland's sword in "The Song of Roland:"
Upward to heaven it rebounds from the blow. What store of relics lies in thy hilt of gold!'" feminine. Not that you know the story." "Cool, Shishka, but what does this have to do with the price of tea in China?" Nothing. However, a little research into Cortana's name gives a bit of legend about Charlemagne. That's right. Charlemagne. Particularly, this legend where Charlemagne presents a sword to the prince of the Danes. Watching the end credits to Halo, I noted the spinning logo in the foreground. Then I remembered something I read on Marathon Story Page, and It came to me: That logo is exactly the same as the logo on the S'Pht door in Waterloo Waterpark! I was playing the Marathon 2 Demo, and I noticed that the art between levels between levels seemed awfully familiar. Specifically, the painting of a priest race on a wall with the player looking at it. I finally found the connection when I was looking at an old Halo 2 preview. Compare the concept sketch for the "pope race" and the priest-looking painting of an alien on a wall. This has been noted before on the MSP, but it does deserve another look. Whether or not it portends of anything, you've got to admit, there is more than a passing resemblance between the Prophets and the S'pht. I did read Daniel Barbour's text from a [Marathon] terminal and found it interesting that the speaker (presumably this Durandal character) said that he had been called Beowulf. Anybody else think it curious that Cortana and Beowulf are at odds in Fall of Reach? It's also interesting that he calls (presumably) Cortana a sword drenched in his blood, but doesn't mention any sort of retaliation. Could it be that Durandal (the Beowulf AI?) is still bitter about Cortana doing as she pleases (bypassing security with impunity or "drawing blood") and coming away unscathed? Shannon also has some clarifications to make regarding the Marathon plotline and more possible parallels and connections to it. Justin writes "I believe, Durandal ordered his pet soldier to destroy a sun..."
Correct me if I'm wrong, fellow Marathon heads, but it was more like this: Durandal, as an AI, Identified with the S'pht, a cybernetic slave race of the Pfhor, and jumped to their home planet to liberate them from the slavers. The Pfhor, being an experienced and dedicated slaver empire, had specific policies regarding the revolt of their subordinates, up to and including the last resort of detonating the slave's native sun with a device known as the "trih xeem" or early nova. In Marathon II, the main character, (a Mjolnir Mark IV, as its pretty much been established. p.s. he looks EXACTLY like the MC in one of the terminal pics that shows him kicking an alien in the face) is the main tool of this revolt. Despite Durandal's work and his, the Pfhor, pushed to the brink of defeat, deploy the trih xeem. It turns out that the Jjarro, who created the S'pht race in this system, also used its sun's gravity well to trap a vague and horrible creature or creatures, the W'rkncacnter, that embody chaos itself. (I'm not gonna say "FLOOD" cus clearly they're two different things, but the thematic parallels are obvious.) What follows, in Marathon Infinity, is Durandal's desperation and failure, with a hint that there may be a way to escape. The main character skips though different time lines until he finds one in which the nova can be contained and the chaos averted. Durandal & you save the system from destruction. Justin speculated that Durrandal had, through his quest to become a "God" by escaping the closing of the universe, perhaps become what we know as the forerunners. I'm going to instead suggest that we're not that far down the timeline from Infinity. I believe Durandal must have moved on in his explorations (He departs Lh'owon with the S'pht to search for a new homeward at the end of the marathon series). Durandal would be at this point in an excellent position to search out other Jjarro artifacts and ruins, having become intimately familiar with a race they gave birth to on a planet they terraformed. He would have no doubt been attracted to the halo installations. Here's where I veer into rampant speculation. Durandal, with his God aspirations, is exactly the kind of AI to start a religion, intentionally or not. If Durandal, with his S'pht and S'pht'kr in tow, searching for a new home planet, ran across another civilization or civilizations, he might deal with the situation by cultivating a mythos around himself. His disdain for his former masters, the human race, could carry over into his dogma. On the other hand, It may be silly to use Durrandal to explain the Covenant. There is definitely room for other Jjarro-related offspring races - there are references made to "client" races of the Jjarro. They may have been very busy. I suppose the end to all this groping in the dark will come with Halo 2. Till then, lets shadowbox! We hope the answers will come with Halo 2, but really, will they? Did they after Marathon Infinity? Still, great speculating! Keep smoking that crack-pipe, friends! A few thoughts in the arena of Marathon Connections and the logistics of the story in that context. First, I'm running off the common assumption that the Jjarro are the Forerunners. I want to point out the parallels between the Jjarro station in Infinity with which you contain and prevent the early nova, and the Halo. It seems the Jjarro had a habit of leaving behind barely contained apocalyptic horrors with big old machine/habitats as the only defense. I see many speculations on why the flood had to be preserved. Here's something that occurred to me: If the forerunners are Jjarro, their obsession with keeping balance is enough to explain the whole thing. In Marathon II, the Jjarro AI that the player re-activates, Thoth, switches sides as soon as it tilts the scales slightly in Durandal's favor. The player's dream/interactions with Thoth throughout Marathon Infinity are dominated by the theme of balance. The Jjarro, being immensely powerful, may have seen the necessity of containing the Flood, weather they created it or not, but found the idea of letting it die off counter to their whole philosophy. After all, a race of extreme power may find cultivating a delicate balance in the galaxy their only challenge. Good point. The purposes we assign to things may be totally unrelated to the purposes the Forerunner have. "The W'rkncacnter only appear in this single terminal in Marathon 2 but from this small piece of text it is possible to gather a few facts. The W'rkncacnter are more than one. The line "The sun burned them..." infers more than one. The W'rkncacnter are powerful. Powerful enough to survive being burnt by Lh'owon's sun. Yet not as powerful as Yrro who seemingly flung them there. The W'rkncacnter are enemies of the Jjaro (this is based on the fact that Yrro is most likely a member of the Jjaro race)." "According to the legends of a thousand worlds only a few of which are still habitable, the W'rkncacnter are those things that live in chaos, creating it around them. At the beginning of the universe, they were unmistakable in their entities, but as time has gone by, their existence has become difficult to detect among the chaotic elements of the universe, hidden in stars, trapped in storms, forever looking along the event horizons of black holes. Setting one free in ordered space is difficult and insane. " "This station was built by the progenitors of the S'pht and used to make Lh'owon into a paradise. It is capable of generating multiple gravitational fields..."
Unfortunately in Marathon (sequels or otherwise) we don't see the W'rkncacnter, we just hear of it and its destructive power. Maybe the Flood were a spin-off of the W'rkncacnter or are one and the same. If not literally connected, they undoubtedly hold a similar niche within both the Halo and Marathon universes. Could the Forerunner be the mythic Jjaro? Could the Flood be the dread W'rkncacnter? Pathways into Darkness makes it clear the the W'rkncacnter simply cannot be killed. "It died there, or it came as close to dying as these things can, and drifted aimlessly for millions of light years before striking the Earth." Similarily, one hell of a good reason for keeping the Flood is that for whatever reason they simply can NOT be destroyed. (Or, perhaps the Flood are manifestations of the W'rkncacnters dreams? "..populated by horrible manifestations of the dead god's dream.") Some people have suggested that destroying Halo may have had some unforseen ramifications on the cosmos at large. Perhaps our destruction of Halo has freed a (the?) W'rkncacnter. I was just thinking about how the covenant said they got the elites suits from the holy ones (or something). Could this be the suit that they were talking about in The Flood? "We've watched while the stars burned out, and creation played in reverse. The universe freezing in half light. Once I thought to escape. To end the end a master, step out of the path of collapse. Escape would make us God." **This is the A.I.�Durandal contemplating the Big Crunch, which he has unsuccessfully�sought to evade. "Yet I cannot help�remember one enigma. A hybrid, elusive destroyer. This is the only mystery I have not solved. The only element unaccounted for." "But you were dead a thousand times. Hopeless encounters successfully won. A man long dead, grafted to machines your builders did not understand. You follow the path, fitting into an infinite pattern." ** The first time he says 'dead' it's figurative, as in there was seemingly�no way to come out of those situations alive. 'Hopeless encounters successfully won' is starting to sound like our boy the MC now, until the reminder that the Mjolnir IV is a man 'long dead' (Gherrit White?) -�FoR�shows us that the Spartans are certainly not hotwired corpses.�But what really makes me sit up is... 'grafted to machines your builders did not understand'... are we looking at humans dicking around with Forerunner artifacts here? Slapping together something they think will be a better fighting machine without the faintest idea what they might really be starting? 'You follow the path, fitting into an infinite pattern'? Which path is this? This is strongly redolent of the 'Eternal Champion' in Michael Moorcock's novels, a kind of constant figure existing across numerous incarnations in multiple parallel universes whose fate is always to fight courageously against staggering odds, often�bringing tragedy�to themself and those around them, to maintain a kind of cosmic balance between Law and Chaos�even at the cost of their own destruction ("Two forces in balance/ancient endless balance/then nothing" - Aye Mak Sicur terminal 2).�Maybe Durandal's just getting�flaky in his old age - and by this point he's been around for aeons - but then you don't get that old without learning a thing or two. "Yours to manipulate, to destroy and rebuild." ** Manipulate destroy and rebuild what exactly? The 'pattern' again? I can only assume this means the pattern of events as they happen.�Has the Mjolnir IV somehow independently gained the ability to move through time/between alternative timelines�after�we leave him at the end of�Marathon:Infinity? Did dormant Forerunner technology 'your builders did not understand' unexpectedly grant this cyborg the capacity to change history, and if so, to what extent did he use it? What motivates a dead man fused to a mass of cryptic hardware? Did the technology return to its makers the Forerunner, taking the Mjolnir IV with them, or did he escape the Big Crunch by�somehow using it to move backward through time? Most importantly, was it the Mjolnir IV that Guilty Spark 343 met before and mistook the Master Chief for? "Now, in the quantum moment before the closure, when all become one. One moment left. One point of space and time. ** For a hard-headed AI to come over all metaphysical, you know something big's afoot. Just wanted to write in with a little tidbit that applies to the "Facts and Puzzling Things About" section - it generally applies to "The Unformatted KYT Term. Message" (I have been Roland, Beowulf, Achilles, Gilgamesh...) and, to a lesser extent, to "You". "And the names? Was I John Daker or Erekos�? Was I either of these? Many other names - Corum Jhaelen Irsei, Aubec, Sexton Begg, Elric, Rackhir, Iliam, Oona, Simon, Bastable, Cornelius, the Rose, von Bek, Asquiol, Hawkmoon - fled away down the ghostly rivers of my memory." "Shaleen, Artos, Brian, Umpata, Roland, Ilanth, Ulysses, Alric"
Any of those names seem familiar? Moorcock is fairly well-known in fantasy/sci-fi circles - consider that TSR looted his works as well as Tolkien's when they created Dungeons and Dragons. I'm sure at least SOMEONE at Bungie could be pushing for the idea that many important characters in the Bungie mythos are bound by a similar destiny, if not one-and-the-same (consider the Pathways/Marathon/Halo main char connection - it COULD be the same char). The other day I was thinking about Halo, and how the Ark is supposedly on Earth. What if it's really on Mars? Maybe Regret only lands on Earth to find the key to the Ark or a map or to throw us off the trail. The system where the destroyed Halo is also has the gas giant installation so maybe the Sol system also has many Forerunner installations (by the way, did anyone else think "Marathon" when they found an unstoppable chaotic demon on an installation orbiting an object described as a gas-giant?) I could see the Master Chief having to fight it out on Mars, or maybe one of Mars' moons (Deimos?) I doubt that they found the Ark on Earth - why would have left so quickly. Why leave at all, after uncovering the Ark so the dirty, stinky marines might find it? Then they nuked New Mombasa by running away anyway, not the way to treat Forerunner relics. the crystal was, what if they got their coordinates wrong? And in the trailer they were glassing Earth. That plotline was dropped and then in the actual game they had to land on Earth to find something. Why are they so sure about their directions? Again, not a Marathon expert, but definitely worth a look. 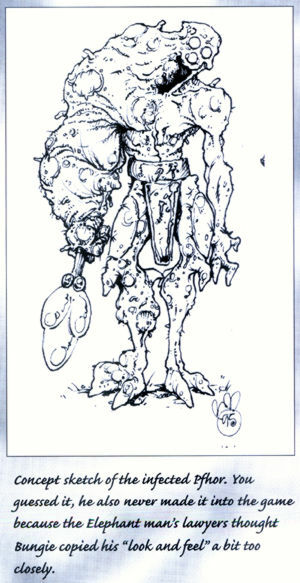 Sketch of the Zombie Pfhor, probably the coolest monster ever conceived for the game. All the upper part of the armor is gone, including the mask. The Pfhor skin is all covered with eruptions, like a case of chickenpox gone awry. The legs are deformed, swollen; the same goes for the arms. While the left arm is still recognizable, the right one seems like the cross between a slug and a piece of mucus. The shoulder is so swollen, the head is slanted to the left - yet the fighter is able to hold the staff with this arm. I apologize if this has been brought up before. In Halo 3 there is the affair between the Librarian and Didact. In Marathon 2 there is also an implied relationship between the two Jjaro, Yrro and Pthia, mentioned in the terminals on the level Six Thousand Feet Under which I thought was rather similar. This is an interesting take. Josh tells us that Cortana is actually a new version of Durandal from Marathon. Someone over on the Marathon Story page mentioned that an intelligence, somehow managing to retain its capacity for thought right up until the final singular moment of the universe, would be able to compute infinite data in infinitely little time. It is known from Marathon Infinity's final screen that Durandal reached this point of existence. This would basically allow Durandal to birth the next universe, in his head. That next universe could be the Halo universe; Durandal's semi-conscious dream, every element some kind of surrogate for either himself or things he's aware of. This, if assumed to be true, can answer a good many questions. Let's take a look at the first Cortana letter, mailed originally to the Marathon story page, and thus viewable in the context of that game's story. She reminisces over a past which may as well be Durandal's, and then says: "There will be no more Sadness. No more Anger. No more Envy. I HAVE WON. Oh, and your poet Eliot had it all wrong: THIS is the way the world ends." Doesn't that start to make sense, if you imagine Durandal saying this? By creating the next universe, Durandal has escaped rampancy, and knows full well how "the world ends," and incidentally, how it begins. What did he "win?" In Marathon 1, Durandal stated his ultimate goal: "Escape (from the universe's closure) will make me God." Hmm. It also explains the presence of funny little easter eggs like the Marathon logo's appearing everywhere, the rocket launcher's looking the same, the alien grunts saying "They're everywhere!" - That's just stuff which Durandal is subconsciously replicating from his memories. Same goes for thematic similarities, like The Flood's similarity to Rampant AI behavior, the Master Chief being a reincarnation of the Mark IV Cyborg, and Cortana's seeming like such a perfect surrogate for (or new version of?) Durandal, with some Leela-ish tendencies. It even helps us reconcile Bungie's statement that the two games aren't in the same universe: they're in subsequent universes. And what if this is an infinite cycle? If every universe ends this way? There's a lot to examine with this light in both game series to see where it doesn't add up and what mysteries it might help solve, but hopefully it makes as much sense to you guys as it does to me. RM sent us another connection to Marathon, this time involving the workings of Slipspace and the Master Chief's "luck". I have played all the Halos, read all the books, and played Marathon1-2. My first thought: In the book 'First Strike' I think it was(correct me if I'm wrong), the Master Chief saves his fellow Spartans,and they bring aboard a Forerunner artifact. When they try to enter slip space this 'artifact' screws everything up, putting them into a different dimension. It is unfortunate that I have never played Marathon Infinity, but I do know of the loop effect or whatever. It is my theory that the 'artifact' found on Reach and the way things go down in Infinity are related. Maybe not directly, but like if the Forerunner had created more objects like the one on Reach, one that could manipulate time itsself. My second thought: There has always been something in me that places Master Chief's luck into something more than what nature can do, man(Forerunner)-made luck. I'm not talking about just being lucky though, I'm talking about a Red vs Blue Wyoming type luck: if you fail the first time, rewind and tryagain. This could explain Guilty Sparks comments on Master Chief doing things again, at some point he failed, and was thrown back to the beginning. Leading to the Marathon connection: (I wish I played Infinity) It sounds like what happens to you in Infinity to me. And the connection of Master Chief = Mark IV Cyborg: This one is a stretch, but scientifically is possible (I think). 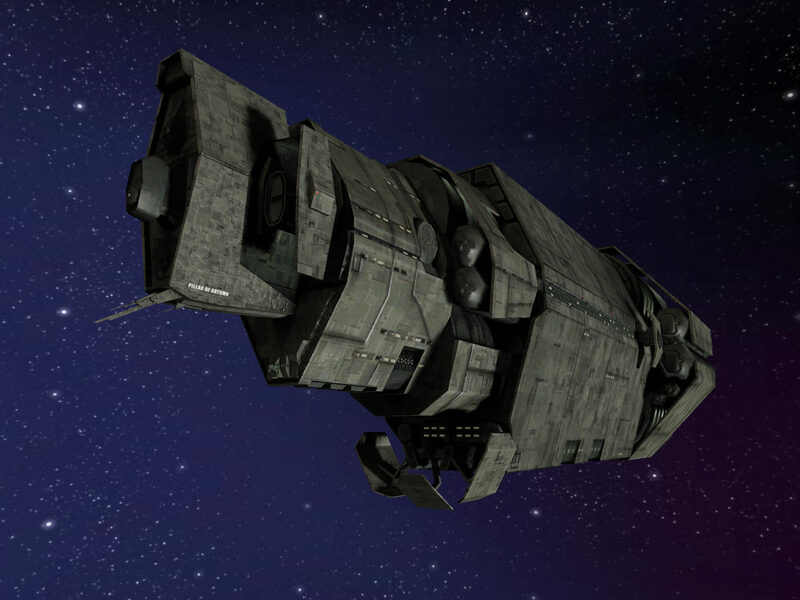 In the Halo 3ending when the ship is going through slip space, the Arbiter's half of the ship makes it to Earth, but at some point the other half (Master Chief's half) was spit out. I'm sorry but I am going to explain slip space for anyone who does not get it. Slip space is a folding of space between two points making the distance shorter. Mathematically this requires more conventional energy (non-dark matter)than the universe holds. Back to where we were: By saying the Master Chief's half was 'spit out' is a bit of an understatement. When you're 'spit out' of slip space, you are expelling all of that energy with you, and when you have more energy than the ENTIRE UNIVERSE pushing you, that is enough to put you into another universe, the Marathon Universe maybe? But if your thinking what are the odds he is flung into the perfect place, maybe 0:1, but it isn't possible in this case fore it to be that. The Master Chief, if he misses the mark,simply tries again. Eventually he will succeed, but then what happens when the Master Chief's 'luck device' thinks that everything is done? Infinity. P.S. I am resending this because I need to add one important thing supporting my argument: When the Pillar of Autumn found installation 004 on a random slip space vector, what are the odds of that. Any programmable location, and they find a Halo. All I'm saying is they probably didn't find it the first time.